•	With swim-lanes and left-to-right, top-to-bottom flow, your process map will be easy to follow. •	Written in verb-noun notation your process map will be easy to read and easy to understand. •	Produced by a qualified process improvement specialist who is Lean Six Sigma Black Belt trained. •	Sometimes it is possible to deliver a same day service, please just ask, no extra charge, I do what I can. •	If your process map is much smaller than 20 steps please call, we can do a deal. •	If your process map is much bigger than 20 steps please call, we can do a deal. •	Sorry about the 20 step rule it's just that sometimes we get asked to map huge processes. •	Happy to do reasonable revisions. •	The 2 day turnaround is 2 working days (Monday to Friday). Weekend working negotiable. •	If you are UK based I do on-site process discovery workshops, please ask for details. Process improvement services are available. 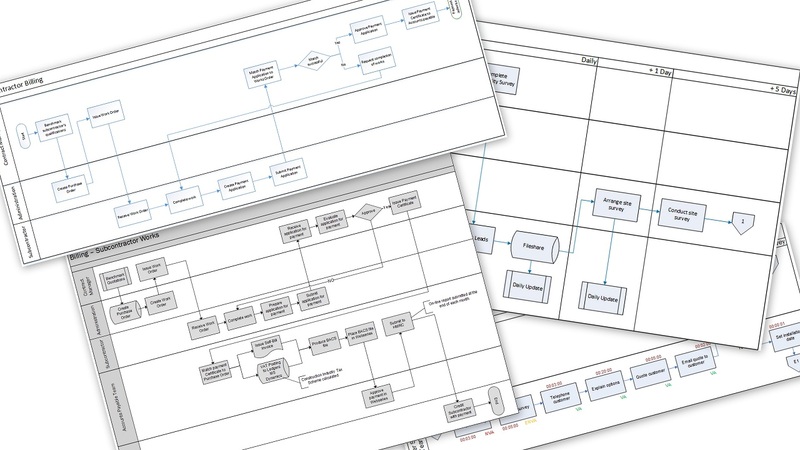 I can analyse your As Is business processes for process waste, process risk, efficiency and non-value-adding activitiesj and then provide To Be business process maps and help with implementation and process monitoring. I am very much familiar with creating process maps from bullet lists and existing process diagrams of all descriptions. For the best outcome please contact me to discuss via phone, Skype or Hangouts. Jonathan's been great and definitely added more value to the exercise for us. Really appreciated both the super fast turn around time and the awesome work. Thanks Jonathan, am sure I will be using your services again! Excellent comms and fast turnaround. Highly recommended. Clear instructions, realistic expectations, a pleasure to work with. Great job. Very good service and fast turnaround. Clear instructions, realistic expectations, great to work with. I completed my first assignment in 1993 when I used IT to save hours of time on a stock taking activity. My first business process improvement activity came in 2007. I led a team that improved internal process for on-boarding new starters. Since than I have led and participated in IT projects and business process improvement projects at all levels from team level right up to corporate level. My clients include both internationally recognised household names and small enterprises. Offering a tailored approach my services adapt to the needs of each client and the standards I set myself are exacting. My aim is to give you benefit greater than cost. - Create efficiencies through better processes and thereby reduce costs. - Improve management and also training. Projects range from small process mapping and workflow jobs to full business process analysis, Business Process Re-engineering and Business Simulation. Process Maturity services are also available. My IT projects have also been wide and varied and have included participation in many projects as a business analyst. Services include project documentation e.g. Project Initiation Document and requirements gathering and documentation, including business requirements, functional requirements and Entity Relationship Diagrams. Combining both process and IT skills I have strong Business Process Re-engineering skills. More advanced skills include IT Strategy. It is vital to ensure business strategy and goals are perfectly aligned with IT systems and services to ensure efficient and effect use of IT and smooth business operation. Many clients ask me to train and mentor their staff. I have trainer qualifications and I am happy to provide bespoke training and mentoring services. - Level 7 CMI Certificate in Leadership and Management Strategy. - BA(Hons) Information Management, Leeds Beckett University. - NVQ L3 Diploma in Business Improvement Techniques, (a strong Green Belt equivalent). - Training in Lean Six Sigma Black Belt, IASSC BoK. - Training in BCS Foundation in Business Analysis, and User Acceptance Testing. All questions and enquiries are welcome, if I can help in any way I’d love to hear from you.